You have probably at one time or another added milk, sugar, or some other sweetner to your coffee. If you wont to try something a little different then try a little cinnamon, a sprinkle of the cinnamon powder, or a stick of cinnamon will do. It will increase the taste of sweetness, without having to add any sugar to your coffee. For the coffee and cinnamon benefits, cinnamon has a high antioxident content, and may contain in one teaspoon as much as whats in a half cup of blueberries. While the caffeine in your coffee will make you feel like your up and running on all cylinders in the morning, adding cinnamon wjll also help to improve your brain functions. So to avoid the harmful affects of sugar on your body, add a little cinnamon which can also improve your insulin effectiveness, and keep your joints working better. Cinnamon is suppose to lower heart related illnesses as well, and can be effective for keeping your arteries working good. Also when you add the cinnamon to your coffee, there is less chance you will be looking for any sweets during your day. 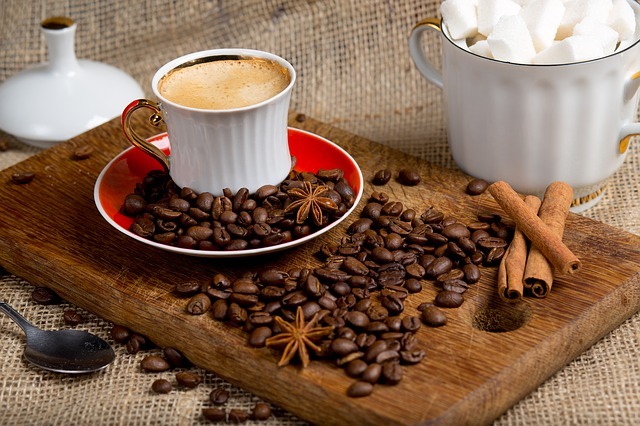 Another good benefit to adding cinnamon to your coffee is you get a variety of vitamins and nutrients with it. One tablespoon has 68% manganese, 8% of your calcium intake for the day, 4% iron, and 3% of your daily vitamin K.
So with all the benefits of a little cinnamon, why not give it a taste, even if it is not to every ones flavour, is like the saying you never know till you give it a try. The rule is to usually add 1/8 teaspoon of the ground cinnamon for each cup of coffee, you will brew up in your coffee maker, and in this way you dont need to add it to each cup. If you like the taste you can put a 1/2 teaspoon right into your cup, and stir it well, and more can be added , depending on your taste for it. If you have a coffee press, then here is the recipe for cinnamon coffee using it. After adding coffee and cinnamon sticks, and hot water, wait about 4 to 5 minutes for your mix to brew, before pushing down on the plunger. This recipe also uses cinnamon plus more spices. You can also throw some whipped cream on top, and if you find it too sweet then leave out the brown sugar. Try it out and enjoy. I will admit that I have never tried this, but have read about others who claim how good it taste. Mix it in a blender for 30 seconds to a minute, and then give it a try. If your buying cinnamon for your coffee is best to buy the better quality Ceylon cinnamon, rather then Cassia cinnamon which is found in most grocery stores. The Ceylon cinnamon is also the prefered cinnamon for baking in many countries in Europe and also Mexico. It has a low oil content, and a sweet delicate flavour to add to your coffee. Having a little each day can heal and create neurons in the brain, which will help to keep away Alzheimers and Parkinsons as you age. Ceylon cinnamon can be ordered on Amazon, and also the Ceylon cinnamon sticks. So for a better health use the Ceylon cinnemon because it has te lowest levels of coumarin, and is of the highest quality, so will go great with your coffee. In Ethopia, a traditional coffee ceremony is where the women roast the coffee beans in a pan over an open fire. next the beans are ground using a wooden mortar and pestle, then they are boiled in a clay pot with hot water. After that the spices, cinnamon, cardamon, and cloves are added to the coffee brew, and enjoyed by all. Trouble brewing in California because of proposition 65 that requires the public to be informed on labels of exposure to cancer causing chemicals, and in this case Acrylamide. Acrylamide is actually formed when any substance that contains glucose, and the amino acid Asparagine are heated. You can find it in breads, cereals, cookies,french fries, prune juice, roasted nuts, cocoa, and coffee beans, and in almost any product that is roasted or heated. No scientific investigation has ever linked cancer to coffee, and just the opposite, as it may protect against cancer, parkinsons, and alzheimers, and more. Who ever is pushing this label onto coffee needs to take a course in toxicology. So in conclusion, enjoy your coffee, plain or with some beneficial spices. They mix together a few different spices, sesame seeds, black pepper, nutmeg, cinnamon, and cumin seeds. Then all of this is ground up together to create a spicey brew for you to enjoy. If you like your coffee black, then here are three natural ingredients to give you a health boost. Mix these ingredients together, until there mixed well, then store them in a covered container. Another coffee using cinnamon is a spicey viennese espresso. Top it with whipped cream and enjoy. So if any one out there has a taste for cinnamon in there coffee, then try out a few of the above recipes, to give a healthy start to your day.